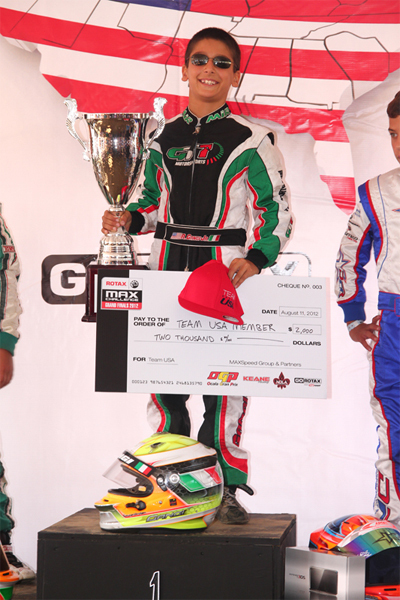 Earning the US Micro Max National title in 2010 at the Rotax Max Challenge United States Grand Nationals, GT7 Motorsports pilot Anthony Gangi Jr. would be back at the 2012 edition of the premier US karting event August 7-11. 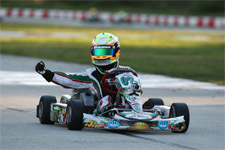 After earning a fourth place finish in his final year in the Micro Max ranks in 2011, Gangi Jr. would look to add yet another national title during the event, held at the Jet Karting of Michiana Raceway Park facility near South Bend, Indiana. Taking on a stacked field of 36 Mini Max competitors during his rookie year in the 9-12 years of age category, Gangi Jr. rose to the occasion, taking top honors after a demanding weekend in northern Indiana. 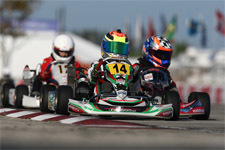 Arriving at the track Monday, August 6 on the heels of a WKA National event in Illinois, Gangi Jr. would show speed to run at the front of the pack during the three days of practice and testing, all run under sunny and comfortable conditions. 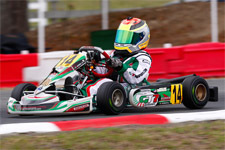 Come Thursday, rain had moved into the area, with Gangi Jr. turning up the wick to put his TonyKart on the pole position during official qualifying, securing the preferred starting position for the three heat race flight format. The New York resident would then end the first official on track day with the heat one win and fast lap honors. Back to the track Friday for the remaining two heats, Gangi Jr. would again scored the win during a dry heat two. Gangi Jr.'s only falter of the week would come in heat three. Holding the lead until the final circuit, Gangi Jr. would be passed coming to the white flag. Trying to find his way back to the point, Gangi Jr.'s competitor ran a defensive line, leaving the GT7 Motorsports pilot vulnerable. 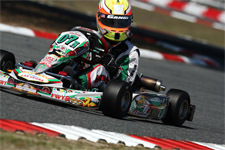 Despite falling back to finish in the third position, Gangi Jr. was able to secure the pole position for the prefinal race on Championship Saturday. Lake-effect rain on Saturday would start the day off with misty, drizzly conditions. Gangi Jr. had proved himself in both the wet and the dry, and the ten-year-old was ready to take on whatever Mother Nature would throw his way. 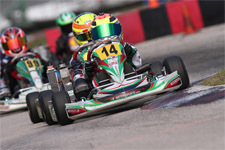 Coming out of the prefinal race with the pole position for the all-important prefinal, after the winner was disqualified, Gangi Jr. looked to capitalize on his preferred starting position for the main event. Making quick work of his competition, Gangi Jr. maintained his advantage through the tricky turn-one and didn't put a wheel wrong from there. Cruising to a five second victory, Gangi Jr. celebrated his second US National title when the checkered flag flew after 20 laps. 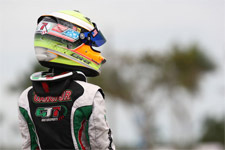 As part of his National Championship, Gangi Jr. will travel to Portimao, Portugal with Team USA for the 2012 Rotax Max Challenge Grand Finals, joining the team during the opening ceremonies and representing the United States as a future competitor at the prestigious international event. Gangi Jr. would like to thank Daniel Lambert (Disco Dan) for the always-great power, Chris Perez, his tuner and coach for the past four years for helping him win his second Rotax National Championship title, as well as his sponsors Millwork Solutions Inc., PKT Axles, Holeshot Drive Systems and GT7 Motorsports. Up next for Gangi Jr. is the Great Lakes Sprint Series event August 31-September 2 at the New Castle Motorsports Park in New Castle, Indiana, before the WKA Manufacturer's Cup series finale at the same circuit September 14-16.